Fits all GARMIN HANDHELD MODELS GPS that have a Micro SD Card slot and the 4GB capacity. e.g. Edge 705/800/805, Oregon, Dakota, Colorado 300/400, eTrex, Astros, Montana, Rino (most models), GPSMap62/76. This Auction is for a Kingston 4GB Micro SDHC card Class 4. We will install for free the New Zealand & AUSTRALIA LATEST V4 TOPO MAP. Note:This is NOT a copy of the Garmin maps but it is very similar, it is a Hybrid of sourced maps that have been put together for you to get the best out of your handheld Garmin Device. These only work on Garmin. No Hi-Tech knowledge or skills required. Put it in the Micro SD card slot - turn it on - that's it. Provides topographic terrain contours at 20 m (65 ft) intervals, approximating 1:50K maps for New Zealand, plus summit points. 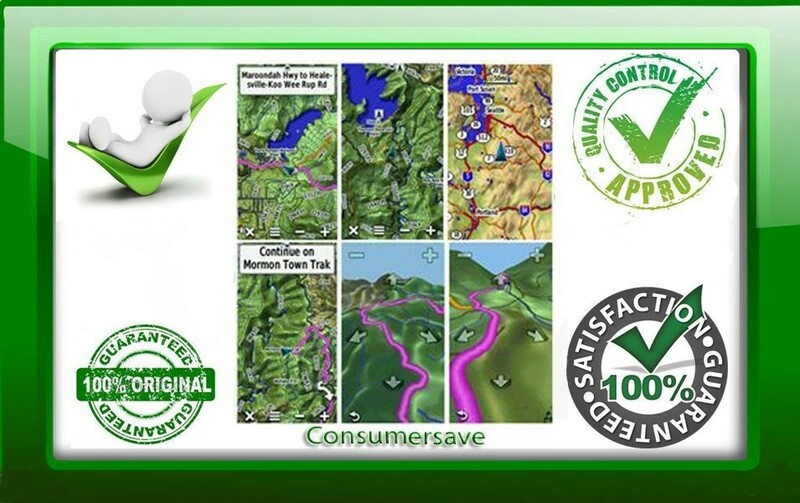 Shows land cover and complete coverage of Department of Conservation huts, camps and tracks for New Zealand. Contains tracks, outback trails, 4WD destinations and hydrographic features, including lake/river shorelines and perennial and seasonal streams. Also offshore islands. Features points of interests in urban, rural and outback areas, including lodging, restaurants, camping locations, homesteads, caravan parks, shopping and more. Displays national parks, forests and reserve areas. Portable between compatible Garmin devices. This is for use in GARMIN handheld Devices only. clayman49:Great Trade Jason, you promised next day delivery and that's what I got, plus the NZ maps work fantastic, I wont have any worries when I'm out in the bush this week CHEERS:-). robglassey:Great trade. Maps are excellent, full topo maps and road maps, and the etrex 30 will even navigate by road.